Jen’s knee should be okay! That seems like the best place to start. Jen has to rest for a couple of weeks and do some physio on her knee, but all the important bits are still intact and fine. Happy days! Almost a week ago we arrived in Locarno, and it feels like things have actually become more hectic since then. 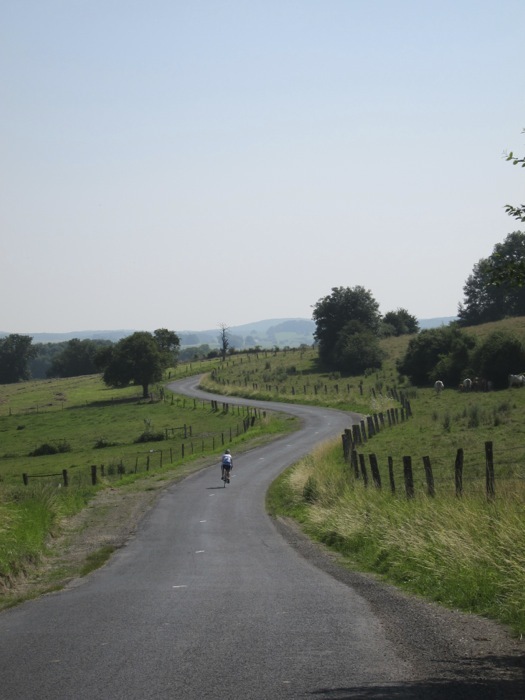 Getting off the bike on day 16 was a mixed-bag of emotions, combining joy and satisfaction at achieving what we’ve been working towards for such a long time with a bit of sadness that it was all over. I’ll admit that the 30 or so hours we spent at my aunt and uncle’s (thanks again Sue, Rico and Ben for being our destination) were long overdue and it was fantastic to be able to play: jumping in the pool, trying to learn to unicycle, and a load of other things which we couldn’t have justified stopping halfway through France to enjoy. The journey home was a lot less pleasant than the ride. Everyone was pretty worn out and ready for home, but towing a trailer meant being limited to 60mph all the way back. We arrived in Bangor around 24 hours after we left Locarno, all ready for bed! Shocking the body by switching from cycling 8-10 hours per day for 16 days and then doing all the above probably isn’t the most sensible idea, and by Sunday evening before we left I had pulled something in my left foot (admittedly while trying to leap into the pool through a 2′ hoop feet-first with a run up) and a mosquito bite on my right foot left me with a giant, inflated, itchy foot. It was probably the first sign that I am actually quite worn down by the adventure. 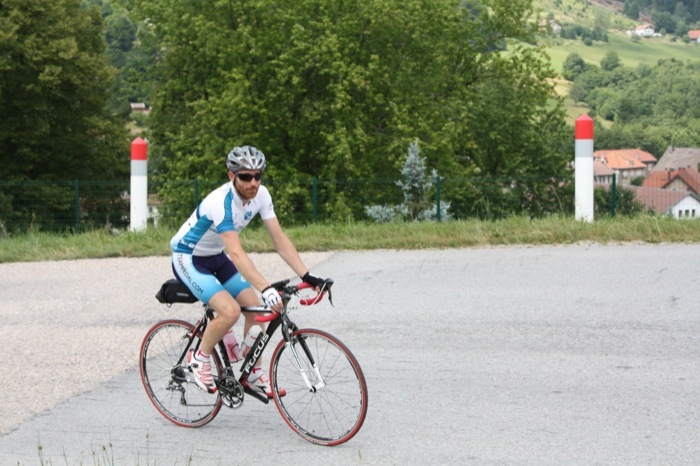 Around the time we finished I was feeling fit, strong and pretty confident that I could have carried on. Over the 16 day cycle I settled into a rhythm and routine which meant I wasn’t wearing my body out too much. Once we had overcome some of the routing issues and the final few days were attainable and programmed in I felt a lot less mentally strained as well. Now we’re all scattered across the UK again the realisation that I need a little rest is dawning on me. Every day by 6pm I feel shattered and ready for bed, and there’s still a lot of unpacking to do as well as all the “nice” things such as returning the Garmin GPS and GoPro to their respective donors (thanks again Blacks, Rob, and Konrad and Sarah). My plan at the moment is to rest my foot as much as possible so I can ride at the weekend, so lugging around the bags and boxes of cycling kit can wait. Having not done anything particularly physical since getting out of the pool on Saturday, I’m eager to get out and do something, and it’s a side-effect of the trip I like. 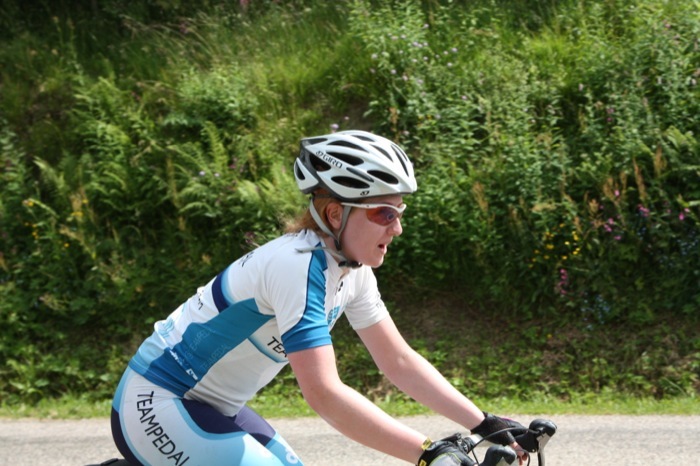 Being physically active is addictive, and now I want to capitalise on my cycling fitness to make the most of Snowdonia and the rest of North Wales, as well as do a couple of bigger day trips including Bangor to Leeds (150 miles). We’re very close to achieving our target, so if you haven’t already, please donate to MS Trust and the Roy Castle Lung Cancer Foundation through JustGiving: http://www.justgiving.com/teams/teampedal. All donations go straight to the charities, whose amazing work hinges on the generosity of its donors. Where to start? Today has been the single most challenging day of my entire life. 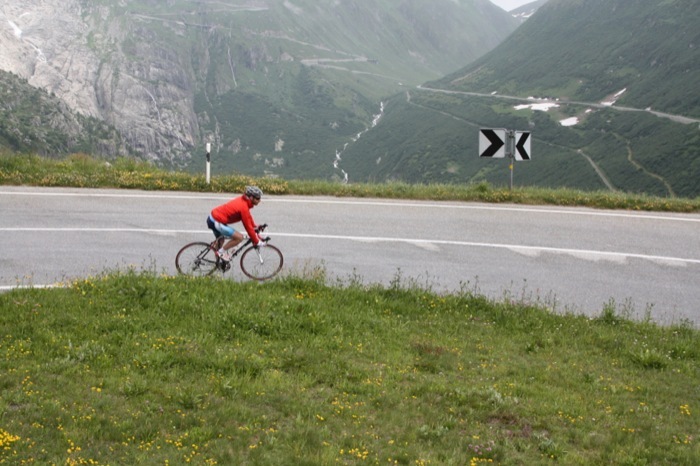 However, reaching the top of both Grimselpass and Furkapass climbing a total of 2,777 metres on a continous incline at gradients varying from 7-10%, has to be the single most rewarding and momentous achievement of my entire life. There were terrifying, hairy moments with sheer clif drops, big loud scary lorries and huge gusts of winds that shot my nerves to shreds, but having Ryan there with me reassuring me along the way, and constantly encouraging me to press on kept me going until I got to the top. 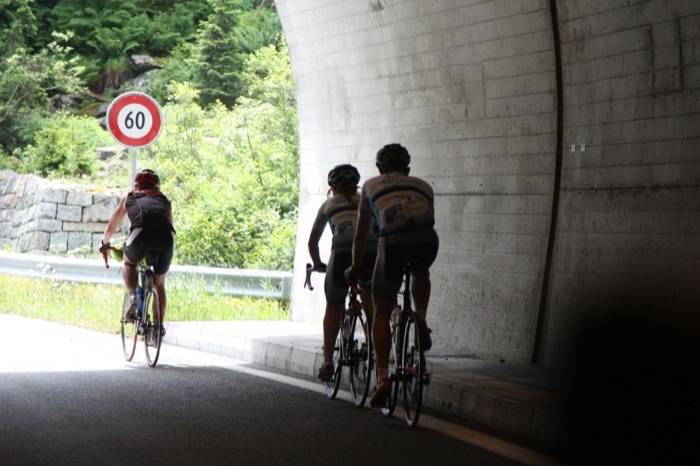 We also had our wonderful support team leapfrogging us up the passes, stopping to take photos of us on the crazy hairpin bends and supplying us with ample water and energy-filled snacks. There were moments when I questioned whether I could actually reach the top, my legs felt like they might explode and my fear kept creeping up and creating a lump in my throat. (which makes it extremely hard to breathe may I add). Ryan, Jen, Dad and Uncle Chris were all there to cheer me on , and I am so pleased that they half encouraged/ half bullied (Ryan) me to push on. Today, I learnt a whole new meaning of the term “tough love”. After a very hilly start to the day, after we took the route on the opposite side of Lake Brienz. 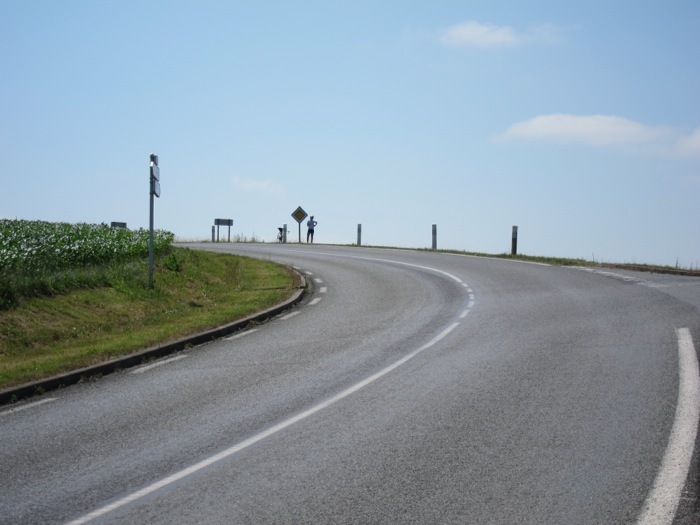 Our intended route was relativly flat, and our actual route turned out to be very hilly. 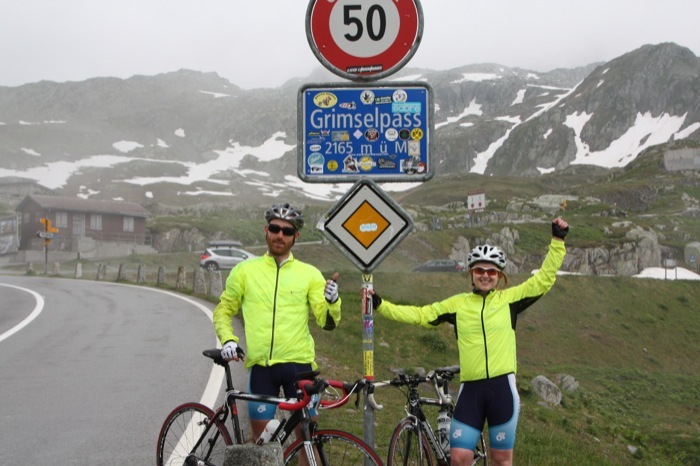 Jen, despite her painful knee, was a trooper, and we had a great average pace which made for a prompt arival at the bottom of Grimselpass. 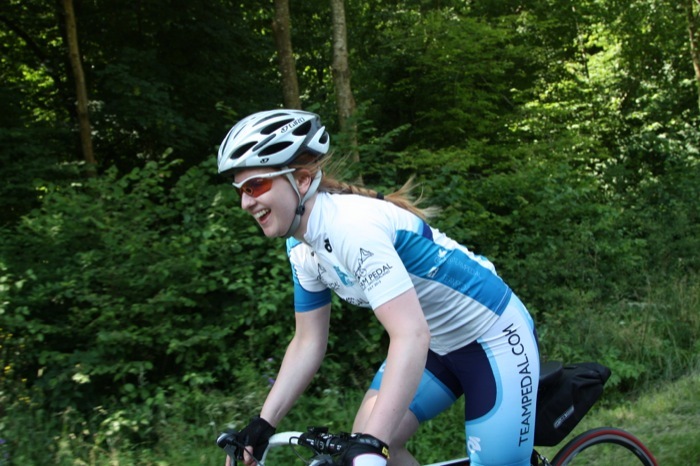 She then became a member of the Team Pedal support team for the duration of the climbs, taking some awesome photos and shouting some much needed encouragment from the windows as they drove past us ! 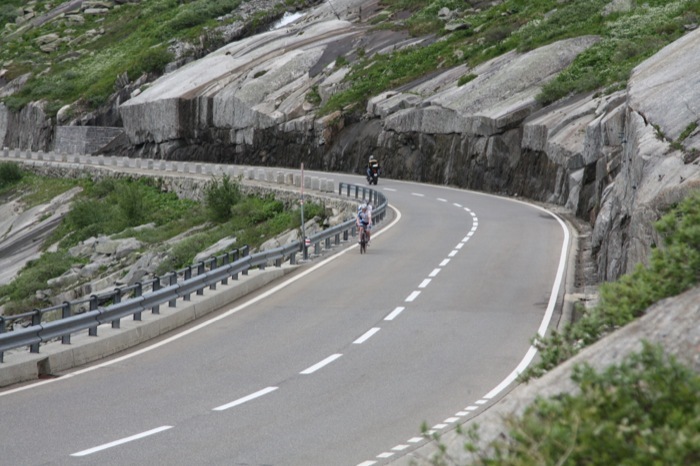 After climbing Grimselpass, we had a short decsent and then climbed Furkapass straight after. After that climb we had the exciting reward of having a welcome party at the top. 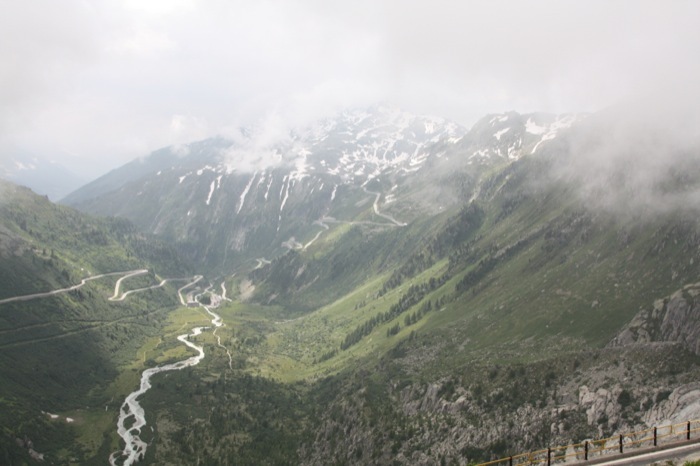 Our Auntie Sue and cousin Ben, made the journey from Locarno (our final destination) to Furkapass to welcome us !! We have now set up camp in Andermatt and are enjoying our last night of camp before our last day of the trip ! All in all I would like to say a massive thankyou to Everyone for such wonderful words of support and encouragment. A huge well Done to my fellow team pedalers, and tomorrow .. let’s go out in style. 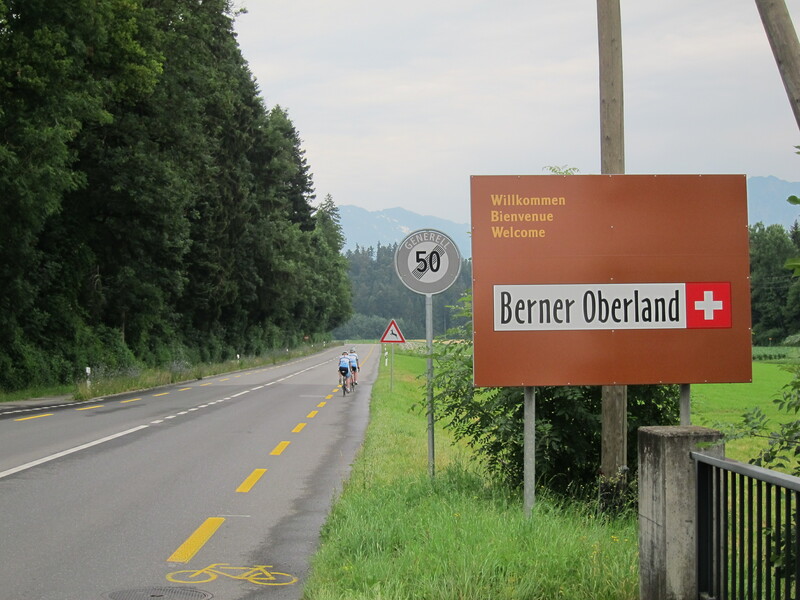 Today we cycled from Bern to Interlaken. We woke at 6:30 to cups of tea and the sound of rain. A quick check of the weather forecast revealed a mixed bag. One forecast said it would be light rain today and then thunderstorms for the next two days. yr.no said it would be thunderstorms today, improving for the next couple of days. This left us with a bit of a gamble: do we risk poor weather and do a half day to Interlaken, or push on and attempt the bigggest day of the trip? In the end we opted for a shorter day because Jen’s knees started to play up again. 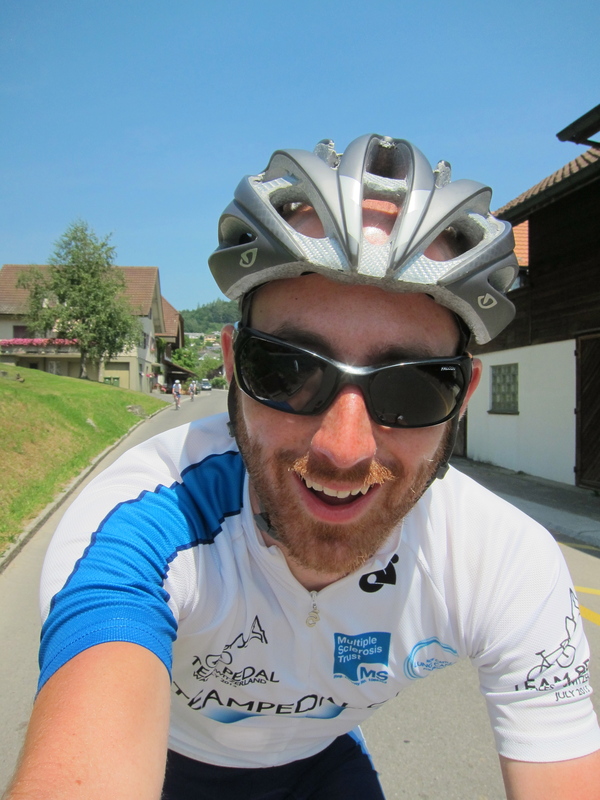 The ride out of Bern was fairly pleasant. By the time we’d got kitted up and set off it had stopped raining, and pottering around at 12mph wasn’t fast enough to kick up all the standing water. 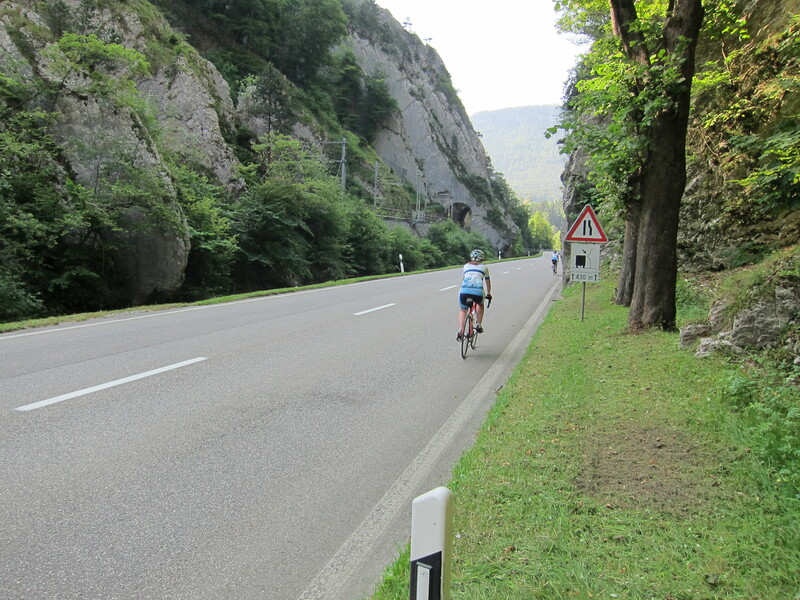 Although we didn’t see the sun for the entire ride, it was a nice change to be cycling in 21 degrees rather than 30. Limiting the ride to just over 30 miles also meant we only needed to stop once for food. 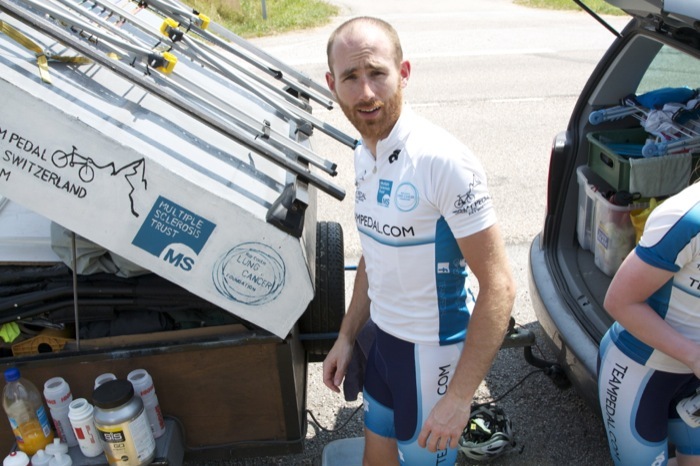 We were supposed to do 32 miles, but a minor detour in Thun took us to a crossing… a rowing boat crossing. Turn around, back into Thun and cross to the right side of the river before pressing on. 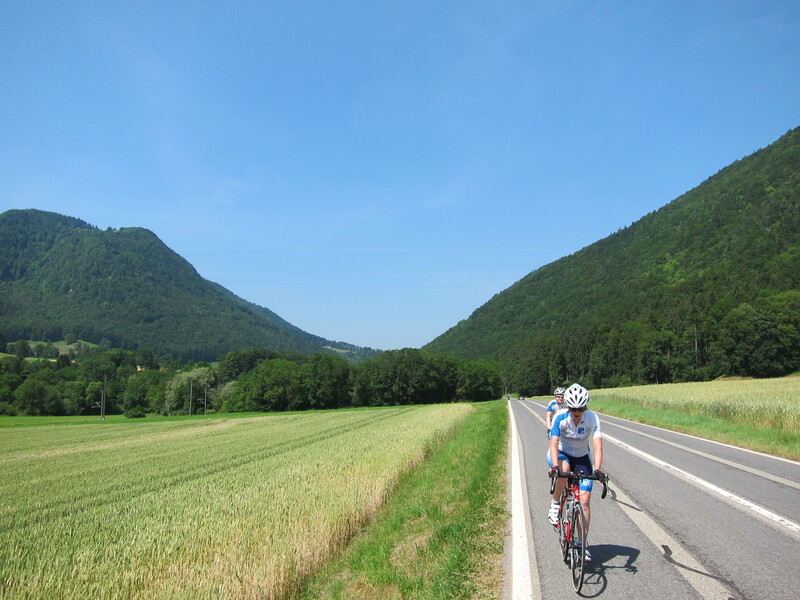 The northern side of Thunersee lake is great terrain to ride. 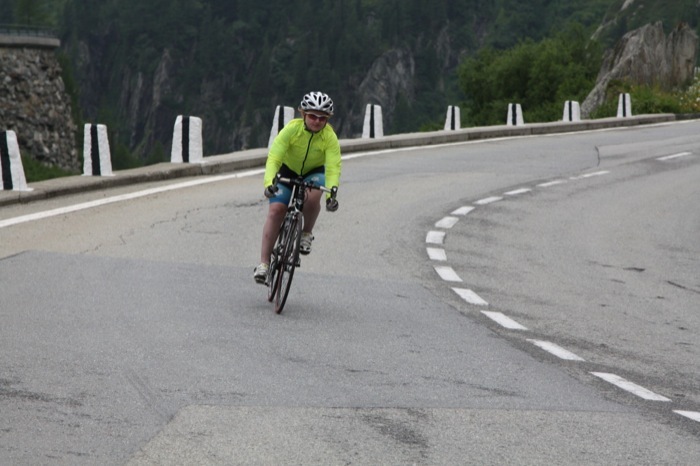 There were one or two too many lorries, but gently climbing and descending meant the views were constantly changing. We arrived at Manor Farm campsite before 12:00, the earliest finish of the trip. This campsite has by far the most convoluted pricing system I’ve ever seen, and every pitch has a different price. After setting up we went for a quick swim in the lake before settling in for some last minute photos of the passes to come to get Megan and Jen excited! The local weather forecast is now that the storms are likely to come in the evenings, so we need an early start tomorrow. This has the added advantage of getting as far as possible in the cool of the morning if the sun does come out. Today I got up and had five Weetabix again. Getting ready for the days ride involves eating a fair amount of food before getting sorted with suncream, lunches, contact lenses and filled bottles. It’s nice once you’re on the bike and don’t have to keep running through a mental to-do list! Last night we got to bed before 9pm, so with nearly 10 hours sleep we all felt pretty rejuvenated and the start was quite prompt. 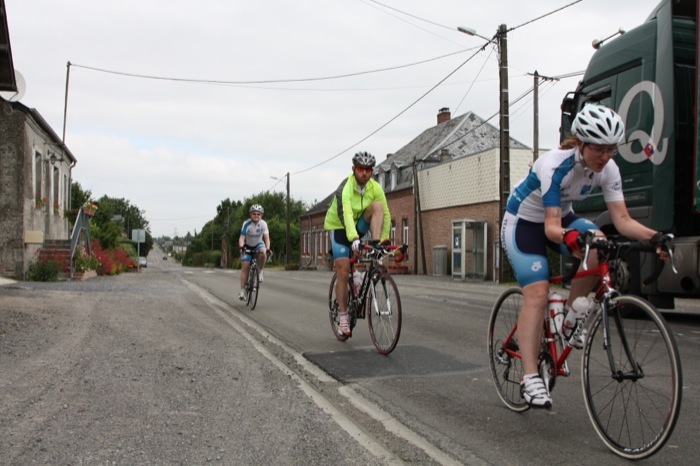 Riding out through Delemont in the cool morning air was a nice change from the hot, sticky afternoon air we arrived in. 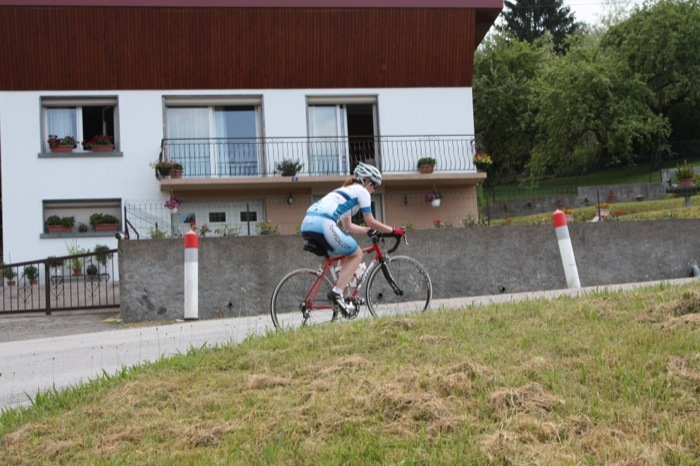 The only hill climb of note was on the far side of the town, leading up through a winding valley before cutting down to Biel. It was absolutely amazing to start riding in mountainous terrain, and this climb was kind to us and didn’t get too steep. We arrived at the top with an average speed of around 12mph, with only a couple of short breaks (one of which saw Jen attempt to propel a banana skin into the undergrowth only for it to end up perched on a tree branch ten feet directly above us!). 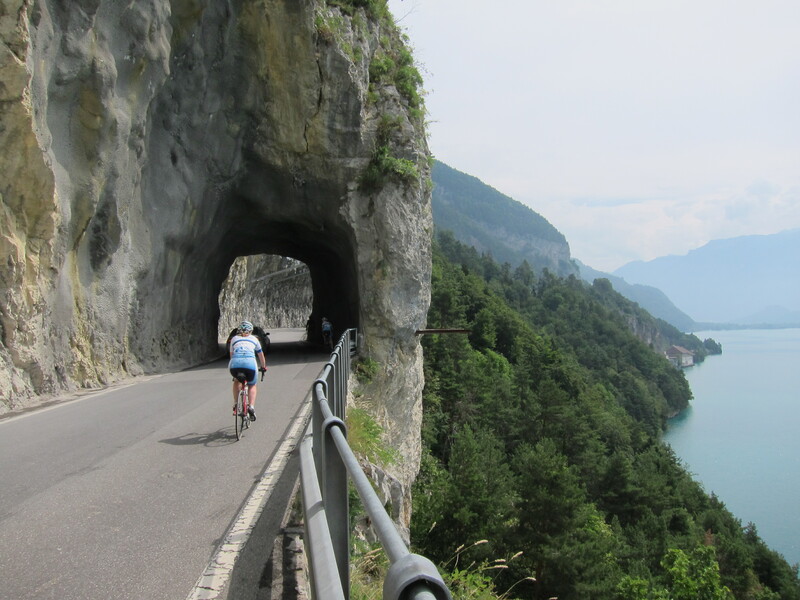 The descent down to Biel had a section of cycle path alongside a fast dual carriageway, which included a couple of tunnels. Perhaps it was the fear, but we made it through at twice our normal speed. 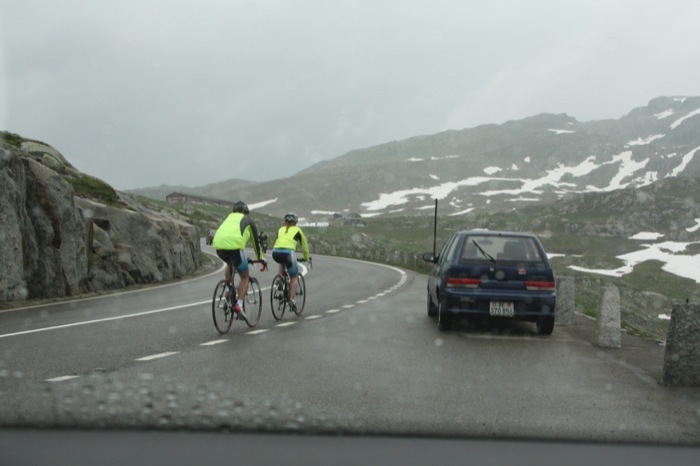 We had met a couple of friendly local cyclists at the top, who warned us in advance which helped. The afternoon saw us slow down considerably. It must have been well over 30 degrees and the heat sapped our energy a bit. What was supposed to have been a 2pm finish ended up being closer to 4pm, although we did have to add on a couple of extra miles because our intended campsite didn’t exist! We set off from Bayon this morning all ready to do 51 miles on another half day of cycling. After our triumph yesterday I was very tired and found today a bit of a struggle. 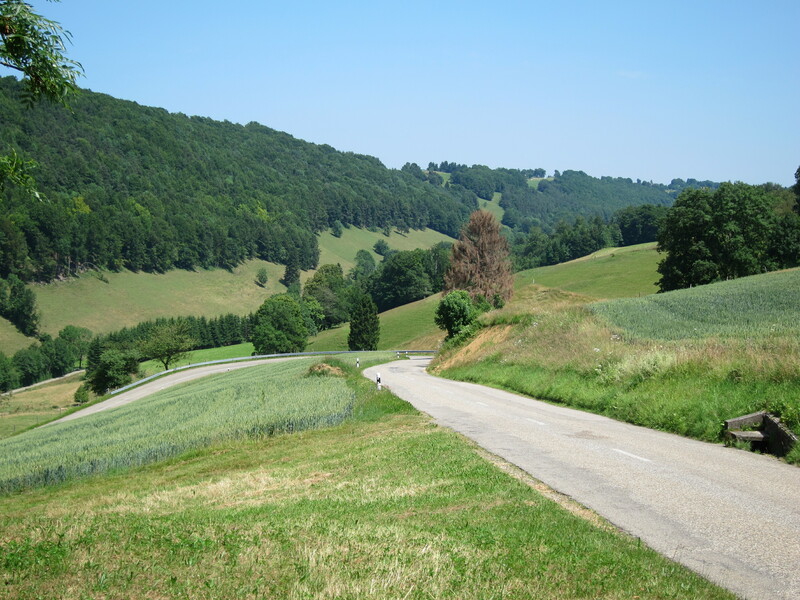 We had some nice roads with a few hills in the early morning but this soon became a steady climb upwards the closer we got to Switzerland. On one particular hill I had to stop quite a few times with knee pain and general tiredness – thankfully Ryan and Megan helped me through with encouragement, because I wasn’t sure if I was going to make it. 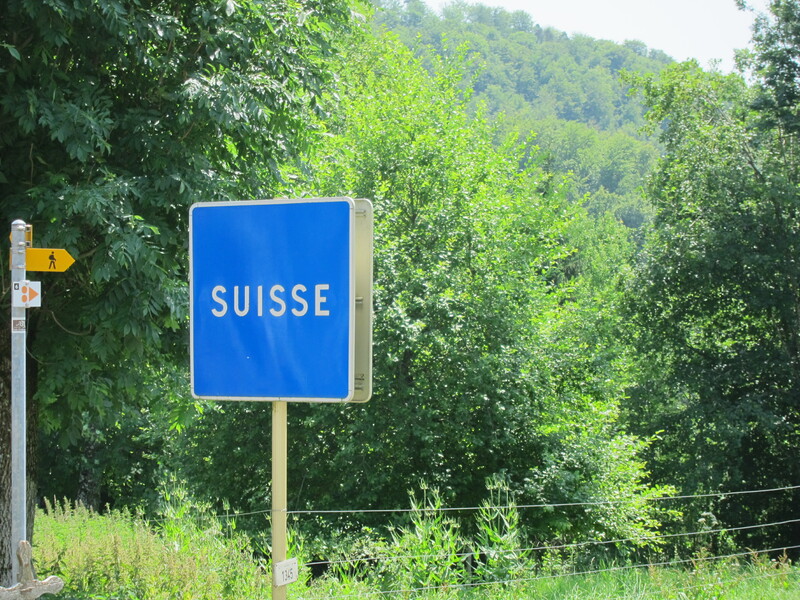 As I’ve been injury-laden for the last 11 days my main focus has been to make it to the Swiss border. I can’t describe the relief I felt when I realised I had made it, but I think the relief drained my remaining energy and the last 15 miles were an arduous slog. 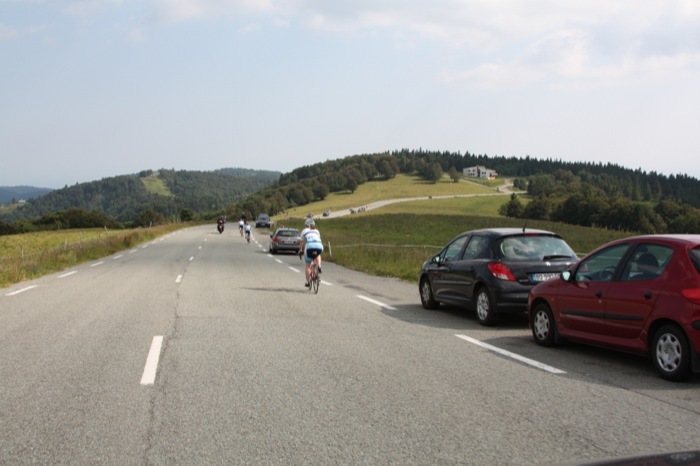 Thankfully, after a little more uphill and some beautiful scenery, we had the descent all the way down into Delemont and the campsite. 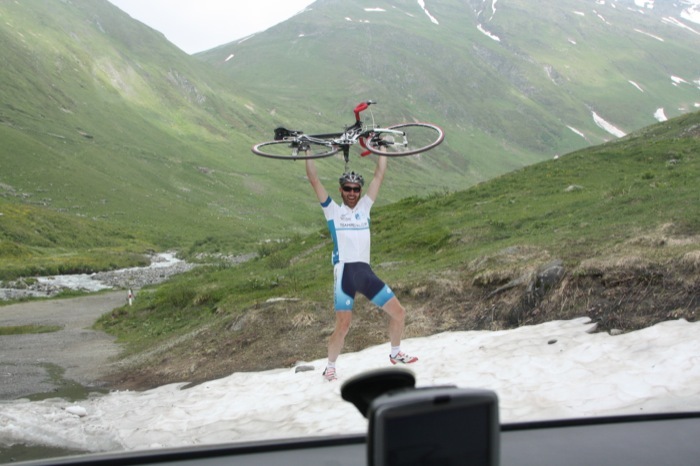 We have now cycled 823 miles, with a total ascent of 13,670 metres. 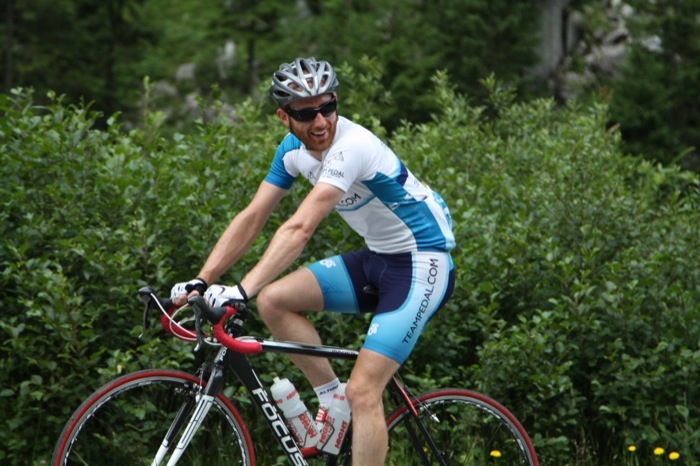 Tomorrow we start our Swiss adventure, with four more days of cycling before we reach the finish line in Locarno. 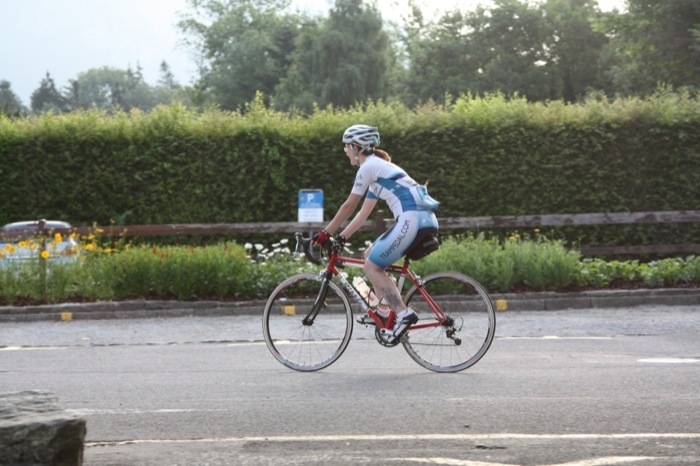 I couldn’t have reached this far without the support of all my team, Richard, Chris, Megan and espically Ryan have been so wonderful in helping me to rest and nurse my knee injury and to make it through the cycling. 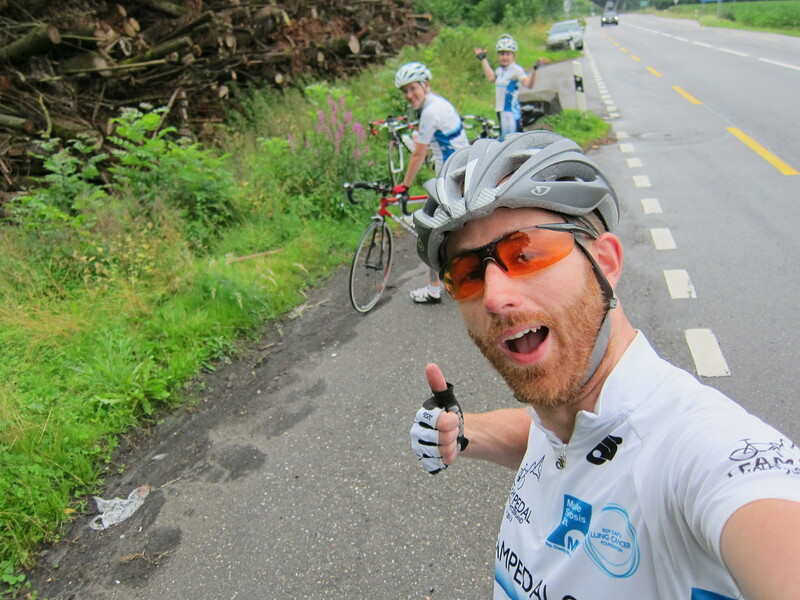 Thank you to everyone who has supported and followed us this far, we only have four days of our journey but these four days include three alpine passes and another ~240 miles of cycling. 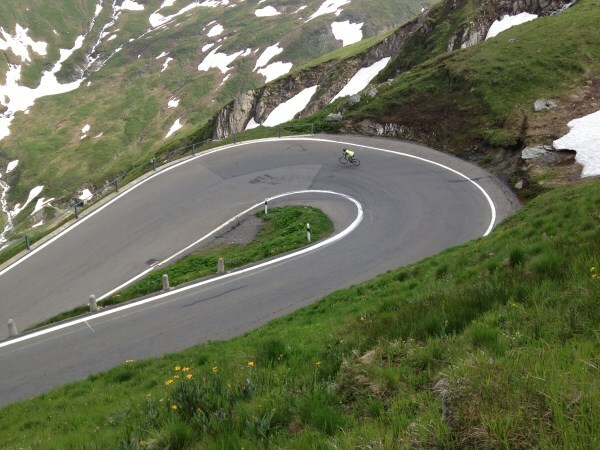 Today we got the first taste of hill climbing and what the alps has to come. 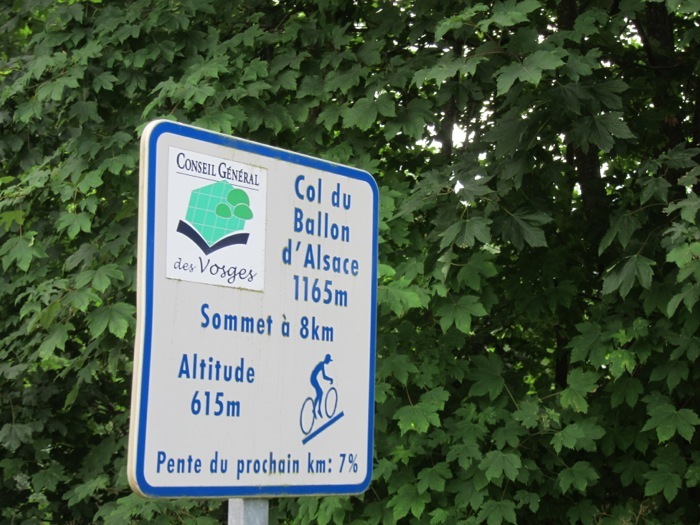 After a long discussion we came to the conclusion that Jen would have to jump in the car for the Ballon d’Alsace, a 7% incline over 8km, to save her knee. Fortunately the rest of the day was set to be gently undulating so we could make good time through the first 70 miles. We had a little issue with the Garmin GPS when we set off. In the Basecamp app we had the whole day planned out. On the GPS it looked fine until we set off when it instantly started re-routing. Fortunately the end result was roughly the same mileage and elevation gain, even if it did take us a completely different way. This came just after a huge issue last night, when we thought for about an hour that we’d lost the OpenStreetMap maps of Europe from the GPS. I won’t bore anyone with the details, but at one point I had the Macbook Pro booted into recovery mode fixing disk permissions. What fun! 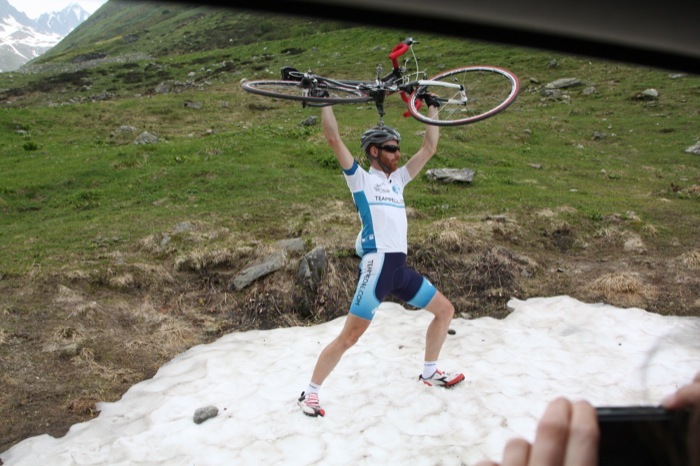 The Ballon d’Alsace is a great little climb. Apparantly (and I’ve not got access to Google to back any of this up) it’s a famous ascent and has been used as part of the Tour de France. It’s a pretty steady 7% all the way, and there are kilometer markers for motivation. Megan was getting quite worried in the lead-up because she felt a little low on energy and had built up the climb in her mind. Once we hit the hill though everything went smoothly. 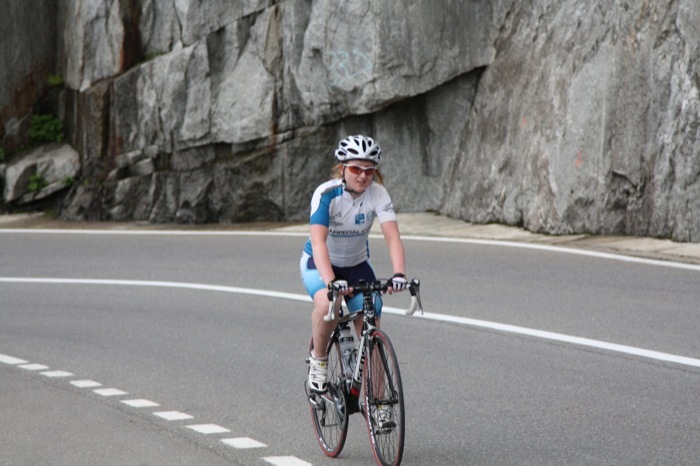 Megan settled into a steady pace and made it to the top quickly. Jen, who had intended to get picked up at the bottom, made it all the way with a little encouragement. It was a great effort from both of them and very encouraging for the alps. To celebrate, there was ice cream at the top! The descent was great with mostly good road surface, but 1/3 of the way down the GoPro mount sheared and it bounced down the road a little. It’s fine (good engineering GoPro!) but the mount is shocking considering it’s specifically designed for handlebars (poor engineering GoPro). Jen’s knee is still giving her problems, but the terrain over the past few days has been very forgiving. 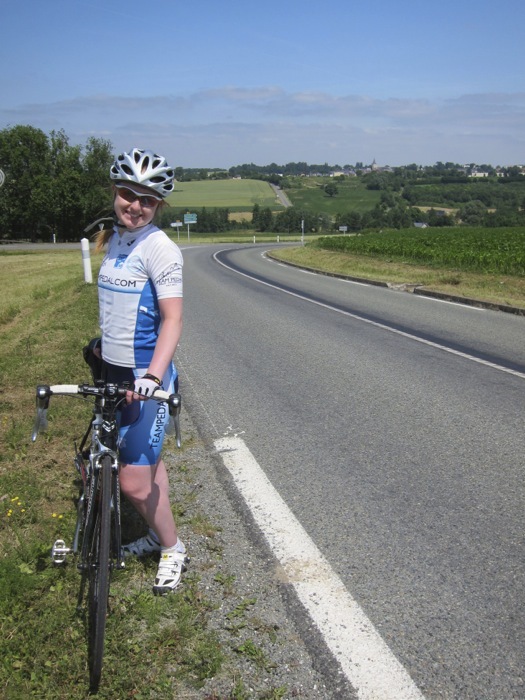 If we had to ride through Shropshire for 2 weeks it would have been game over for Jen, but the eastern route through France is perfect for cycling and doesn’t throw too many steep hills at you. I would love to add a load of detail about the rest of the day, but a minor navigational error at the top of the Ballon resulted in us shooting off the wrong side and ending up with an additional 10 miles to ride to the camp. Making the day 90 miles in total wasn’t so bad, but it’s the last thing you want to do when you expect to coast for 10 miles into the campsite. As a result we’re a little late getting sorted out and it’s already past bedtime! The next three days are deliberately shorter so we can get a bit of energy for the big alpine days. 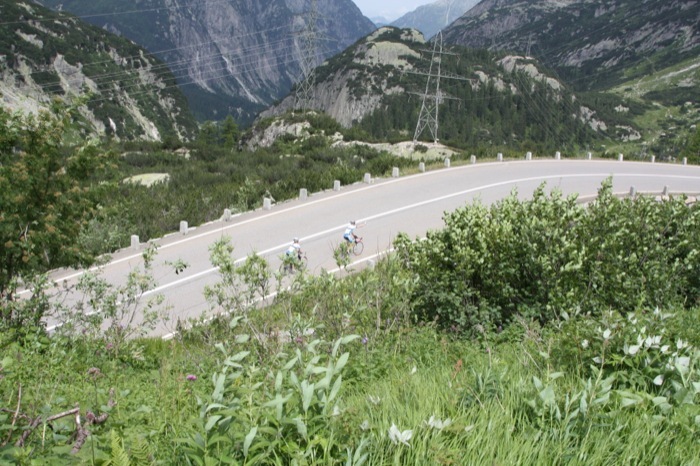 With no more than 60 miles per day we should be feeling fit and energetic for the fourth when we have to tackle the Grimsel pass and Furka pass setting off from Interlaken. 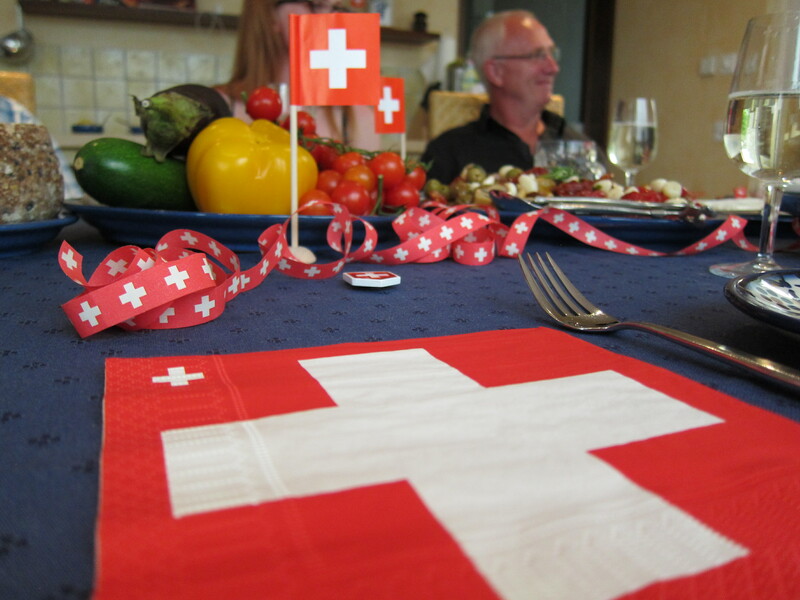 We’re meeting family in Andermatt that evening so there’s an added incentive to arrive early. Megan … on the way up ! On the way up ! We have now made it to Verdun and are at our third French campsite and 256 miles in to France. In total we have now cycled 641 miles, with a total elevation ascent of 9906 m. If we were cycling 24 hours a day, we’d have so far cycled for three and a half days straight. Thankfully we’re not cycling all day, we give ourselves a few hours sleep a night. 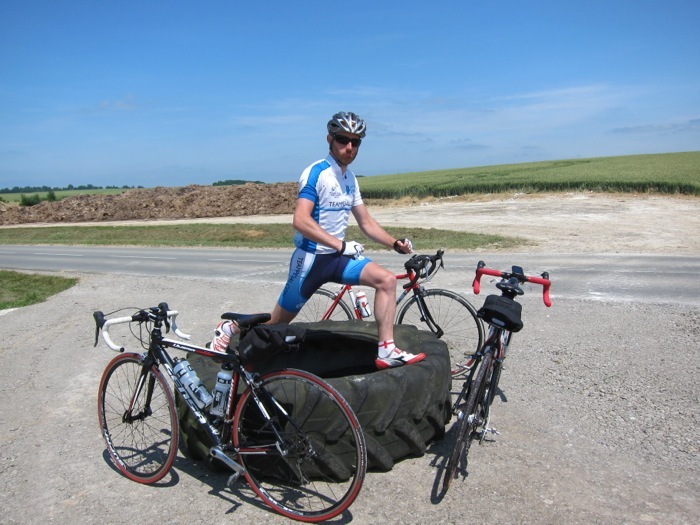 Day 7 of cycling saw us set off from St Omer and cover 93.6 miles. The skies were completely clear and temperatures reached 30 degrees. With very little shade we were all soon melting. 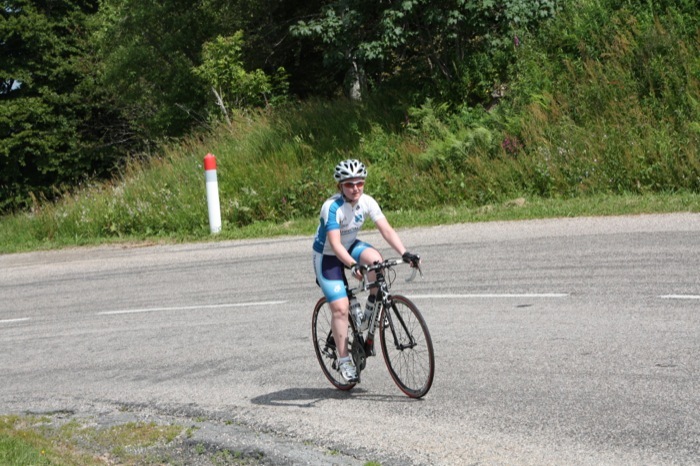 We cycled well for the first 30 miles but after a particularly busy section, through a major intersection and a few hills, my knee completely gave up and we had to stop until I regained some movement. 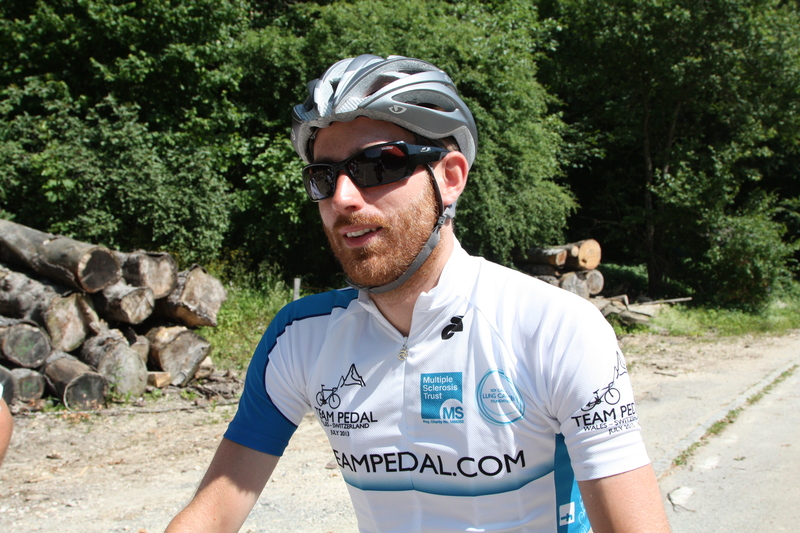 The rest of the team were great supporting me, especally Ryan, who also has to navigate us as well as look out for me. We arrived at the campsite in Frasnoy to find ourselves surrounded by very enthusiastic kids, one of whom asked Ryan if we were part of the Tour de France. I don’t know much French, but I think he said we weren’t! 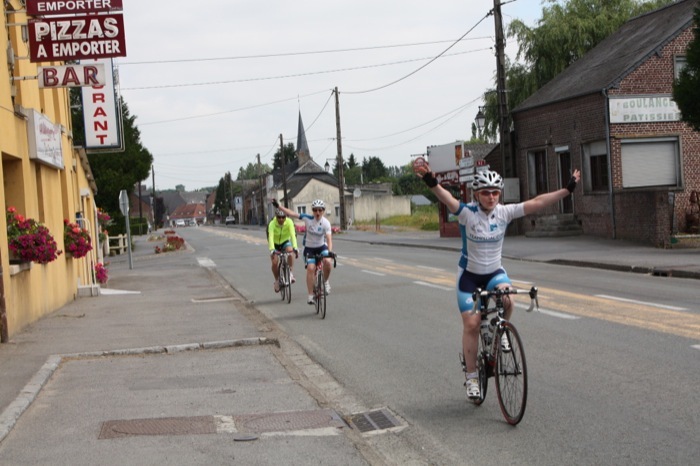 One great thing about cycling through France at the moment is that lots of people are enthusistically cheering us on as we pass…and occasionlly just yelling “Tour de France! !” at us in a very relaxed French manner. It creates a great atmosphere. 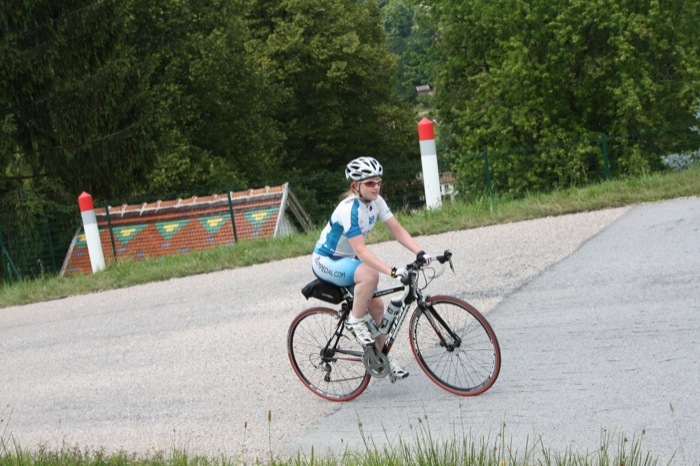 Day 8 was our second big day of cycling in a row, with 84 miles planned from the campsite in Frasnoy to Attigny. The morning was the best yet of the trip, as it was overcast and quite cold – such a relief after these hot temperatures. For the first time since day one we needed to wear jackets for the morning. Around lunchtime the sun came out with a vengence, but we also had a good tailwind for a portion of the journey, which really upped our overall speed. We also had our first experience of cycling on cobbles, a somewhat unpleasant experience that I’m in no hurry to repeat! About 10 miles away from the campsite I stopped to stretch my knee out a bit, which was lucky because we noticed a text from the support team saying the campsite had been changed as it was no good, we now had to head in a slightly different direction. Lucky we stopped really, or we would have turned up to find a field without any camping and our beds no where to be found. The last 10 miles were excruciating for me. My knee seems to flucuate between mildly uncomfortable and incredibly painful, which is fine as long as it goes back down to the less painful side again… unfortunately sometimes it just refuses! I have never been more happy to arrive at a campsite than I was yesterday, it was a relief to be able to sit down with an ice block on my knee. I think we’ve accepted that my knee is unlikely to get better on this trip as it probably needs a good month of rest. I intend to keep going until I absolutely have to stop, but for the moment I’m being helped along by all this wonderful team, and my friends Ibuprofen, Codeine, Ibuprofen gel, Deep Freeze, ice, compression knee support and lots and lots of chocolate chip brioche. Day 9 was a half rest day for us, with only 55 miles to do in the morning, before we could take the whole afternoon off. We made it to Verdun around 2pm after quite a nice morning. My knee didn’t really hurt that much, with only a few twinges towards the end of the cycle, so we could make some good speed. We were able to get some rest this afternoon whilst preparing our lunch, drinks, and the route for tomorrow. The plan for tomorrow is 77.5 miles, though we still need to work out if the campsite we’re headed towards actually exists. Hopefully we will be able to update more tomorrow, if we have an internet connection. Megan at the top of a hill, somewhere.